Verizon or T-Mobile, what's the best carrier to have an iPhone X or Galaxy S9 on? Entangled in a patent war with Qualcomm, Apple is trying to avoid the use of its components like cellular modems anyway it can, and has been shipping iPhones with Intel modems for a while now, destined for GSM networks like AT&T. The iPhone X isn't spared this duplicity and comes in versions with both Qualcomm's X16 LTE modem, and Intel's XMM7480. The X16 was the modem of choice for most flagships sold in the US last year, as it allows CDMA network tapping, and up to 1Gbps downloads, but since the Intel chip maxes out at 600Mbps, Apple neutered the X16 to even all models out. The bad part, however, is that there are still differences in download speeds between the iPhone X's A1865 model, which is on Verizon or Sprint, thus uses the Qualcomm modem, albeit in a crippled version, and the more widely available A1901 variant with the Intel modem that's shipped to AT&T, T-Mobile, and most every other GSM network globally. What's left to test now? Well, how does the iPhone X fare against an even faster X20 in this year's Android flagships with Snapdragon 845? 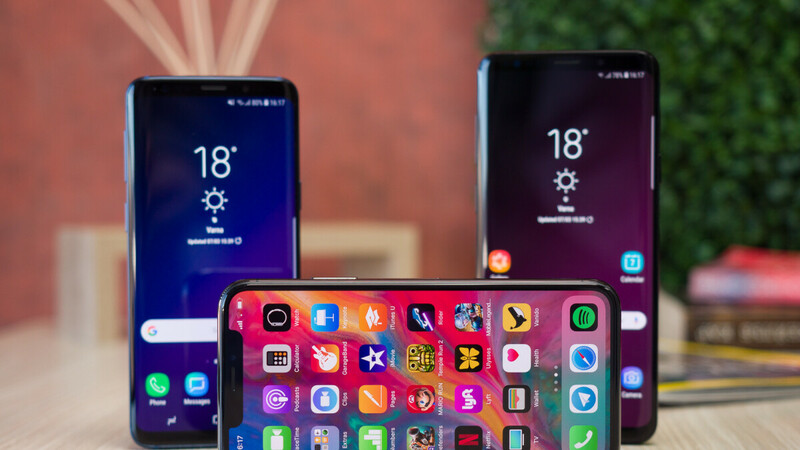 You apparently need a phone like the Galaxy S9, or the G7 that support the latest LTE cat. 18 speeds of up to 1.2Gbps, and all the new rural bands that T-Mobile and others are rolling out across the country, too. The folks from Speedtest ran a comparison with the iPhone X, and found out it serves much slower download speeds on average than Samsung's latest Galaxy S9, no matter which carrier it's hooked to. Overall, if you are an iPhone X owner, you are best off on Verizon, as you can see from the table below, but you will still experience much slower speeds on average than if you are with the Galaxy S9. Given that in big cities the two fastest carriers - T-Mobile and Verizon - are crossing the 30Mbps average speed threshold these days, that difference might start being noticeable. 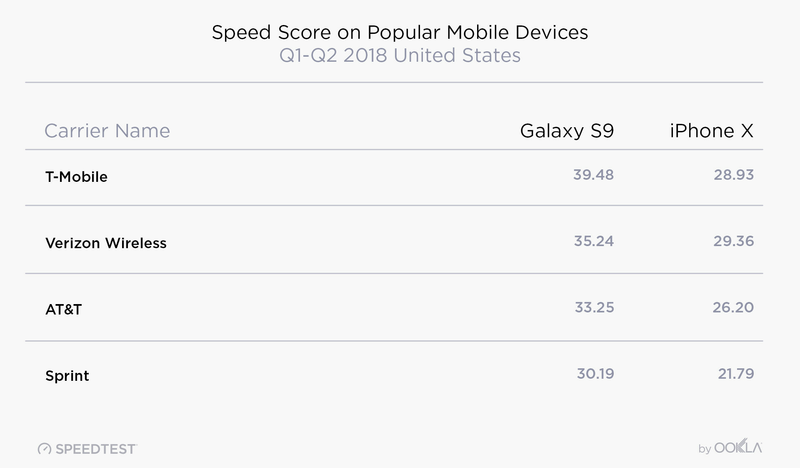 Bear in mind that the report generated more than 300,000 iPhone X samples, while the Galaxy S9 pool was ten times smaller, but it's still quite telling who's a speed king and explains why the S9 was the phone of choice to demo pre-5G speeds achieved on a commercial LTE network recently. The inferior version of the qualcomm chip seemed to refer to the A1865 from Verizon if i read it correctly, vs the intel modem in the A1901. I though that was just in relation to other qualcomm modems and not a comparison to the intel at all. It seems like even though the modem isnt saturated, speed differences can still be felt. Yeah. That surprises me a bit. I would think that since both of their max speeds are well above that it wouldn't make a difference. This seems to align with the previous study that was done on speeds on different carriers. The Galaxy S9 completely demolishes the iPhone X in connectivity. The score and speeds are vastly higher. This isn't that surprising, as the iPhone X has an outdated Cat 12, while the Galaxy S9/S9+ both have a CAT 18 LTE modem, which is capable of speeds of up to 1.2 Gbps. However, the difference is felt at every single connection, as the better modem attains better speeds and stability in every scenario, as it's simply newer and better tech. This is seen from the scores in this test. I'll say it again. Samsung and hardware, they're among the very best at it. How many times have you experienced these “vastly superior” LTE speeds, though? iPhone X has a better camera though.